Let’s face it everyone, the Philadelphia Phillies have been down right horrendous for this entire season. They are the worst team in the majors at this point, sitting in the bottom-half of the league in terms of team ERA, batting average, average with RISP and runs. While very few didn’t expect the Phillies to be setting the earth on fire, the majority of Phillie fans did expect them to be able to win some games due to fundamentally sound baseball. In the season’s first half, there was hardly any fundamentally sound baseball to be found. While Philadelphia’s first half exhibited a few bright spots from Aaron Altherr, who showed the Phillies brass that he deserves a shot to be an everyday outfielder going forward. Or, from Pat Neshek, who has solidified a viable role in the bullpen. As a whole however, the core of the Phillies’ players have severely underperformed. On top of that, some of their top prospects have suffered down years as well. J.P. Crawford, a top 15 prospect for much of his pro career, comes into the second half slashing .212/.328/.330 with six home runs and 34 RBIs. Now, I’m not saying that he is a complete loss, because after two straight rough years, his plate discipline continues to improve. Although, I think a lot of his luck comes with poor BABIP numbers, but I am one of the few fans left that believes in this kid. Mickey Moniak, Philadelphia’s first overall pick last year, is having a pedestrian year at the plate, slashing .201/.239/.286 wRC+, though you must remember that he is almost two and a half years younger than the average player in the Sally League. He still seems destined for big things though, but it’s disappointing to have this happen considering what’s going on in the big leagues. As with prospects who have grinded through abysmal seasons, there are also prospects who have enjoyed monster seasons, some of which will be impacting the Phillies in the near future. 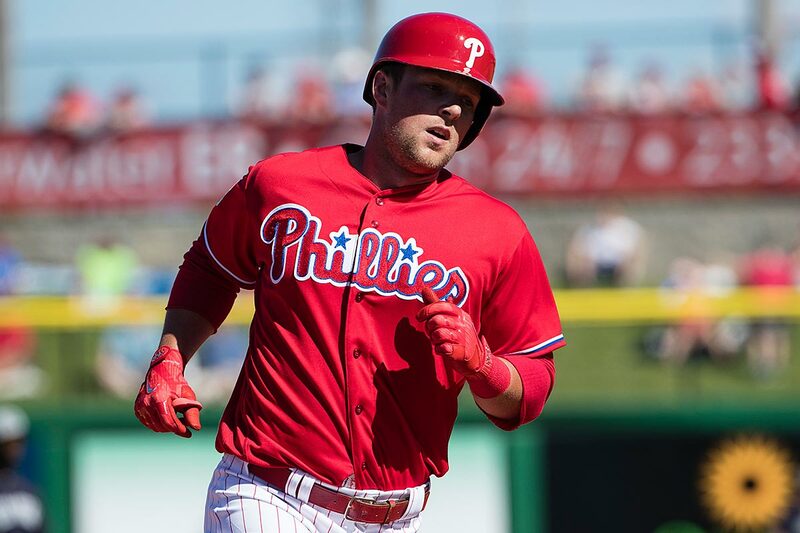 Rhys Hoskins, the right-handed first baseman down at Lehigh Valley (Phillies’ Triple-A team), has continued his emergence of last year and has been hitting the threads off the baseball. By being a right-handed hitter who can only play first base, Hoskins must mash to be able to make an impact and that’s exactly what he has been doing for the last two years. This year with the Iron Pigs, Hoskins is slashing an admirable .289/.385/.576 with 20 homers and 66 RBIs. More impressively, he has done all of this while striking out 53 times and walking 47. That’s incredible discipline for a power hitter. The Phillies are hoping that prospect Rhys Hoskins can sustain his hot hitting this season in the minors, and hopefully get called up soon. (Photo Courtesy: philly.com). Scott Kingery, who was already regarded as an above average second baseman, exploded onto the scene with a combined 22 homers between Double-A and Triple-A. He will probably not get a call up this year due to the team not wanting to use a 40-man roster spot on a player, however, he has turned himself into an elite middle infield prospect. If he can continue his power surge and pair that with his speed and defense, then he becomes a devastating top of the lineup guy for years to come. Let’s not forget though, the prized jewel of this system is Sixto Sanchez. Many prospect gurus realize how good this kid is, and he has made many Top 50 or 100 lists all across the minor league pipelines. Sanchez is a 6-foot right-hander who has a blistering fastball that can touch triple digits. During this season, Sanchez has shown that he can carry that high velocity throughout a start. The 18-year-old signed for a $35,000 deal back in 2014, and has since evolved into a tremendous talent for the Lakewood Blue Claw, the Phillies Single-A affiliate. With the deadline fast approaching, the Phillies have made the league known of the fact that anybody can be had on the roster for the right price. The Phillies have some pieces that could be very attractive to teams, both rentals and pieces with years of control left. The rentals that would seem to receive the most interest are Neshek and Howie Kendrick. Neshek is coming off his second All-Star season and has posted a stellar 1.27 ERA with 72.9 K%. Kendrick has been a great bat for the Phillies when he was healthy. He is currently on the DL however with a hamstring strain, but Matt Klentak, Phillies GM, stated that Kendrick should begin his rehab assignment sometime this week. Showing teams he is healthy before the deadline should help maximize his value. 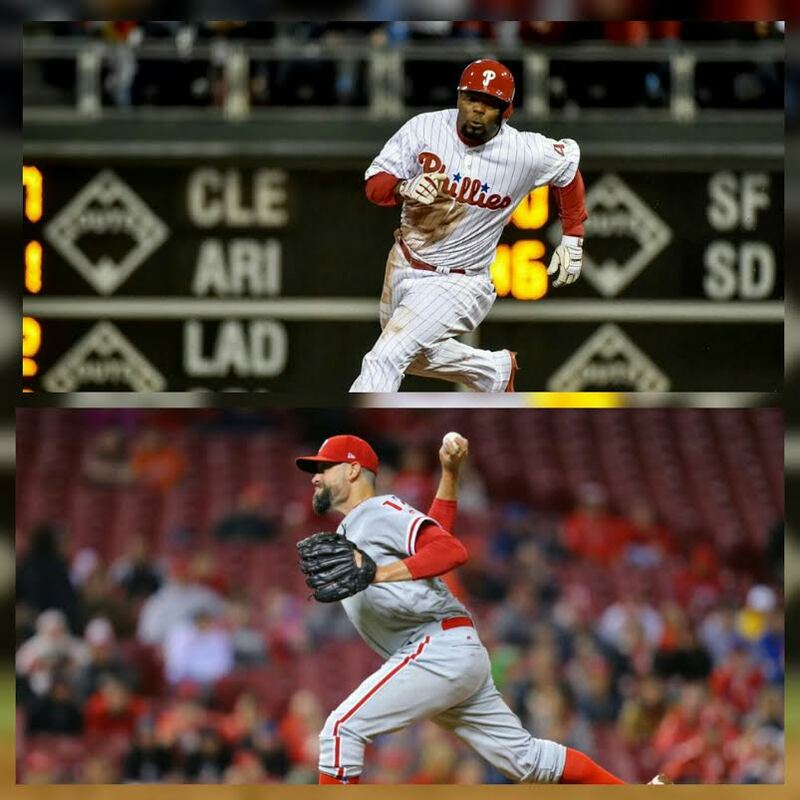 Pat Neshek and Howie Kendrick now emerge as valuable trade pieces for the Phillies. Philadelphia isn’t just littered with rentals though. Players that are under control usually get bigger returns for a player under control, and the Phillies contain numerous players who could interest buyers around the league. Cesar Hernandez, who is also currently on the DL, has been talked about a lot as a young talent who the Phillies could look to deal with. Hernandez has been a reputable hitter for the duration of his Phillies career – batting .280 with a .348 on-base percentage – that alone carries legitimate value as a top of the order bat around the league. Teams who are interested in Dee Gordon, like the Royals and Cardinals, could also be interested in a player like Hernandez. Tommy Joseph, who also seems likely to be moved to make way for the Sacramento State product in Hoskins, doesn’t possess much value, being limited to first base in the field. However, he could bring some power to a contender who needs it. Joseph might be packaged with an expiring contract like a Joaquin Benoit to maximize his value. But, the most intriguing player out of all the ones that Philadelphia is willing to send away is Maikel Franco. The once highly touted prospect has struggled in the Majors and it might be best for the Phillies to cut ties with him. Franco could potentially be traded simply for a change of scenery, in return for a player with skills who has also struggled at the major league level. Not only might they trade prospects, the Phillies might be looking to acquire players to help them beyond this year. Ken Rosenthal of FOX Sports reported this Tuesday that the Phillies were inquiring about Miami outfielder Christian Yelich, and presumably Giancarlo Stanton, if they’re willing to take on his entire contract just to acquire him. That would be an NL East blockbuster, but might not require the biggest package due to the $339.5 million. Corey Seidman from CSN Philly also proposed a package based around Franco and starting pitcher Vince Velasquez that could maybe get a deal done. Even though the Phillies have been, in some cases historically, bad this season, there are reasons to be optimistic about the direction that this team is heading. They do still have a very deep farm system, maybe not with many household names, but they a lot of money to spend in the next few years, especially for the prized 2018 Free Agency Class. Philadelphia has shown that they are going to start to get aggressive to turn this thing around, and this year’s upcoming trade deadline is going to give them a chance to start doing that.